Lowered the threshold on the IR LED REM channel from 196 down to 156. 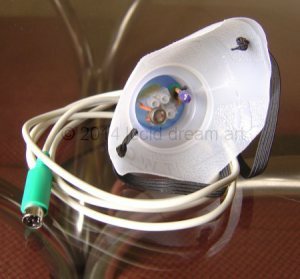 This follows on from my previous post about the Wild Divine Lightstone where I have included more detail about the sensors themselves in relation to my DreamJacker mask project. I have now also utilised a suitable IR led from an old remote control to act as the transmitter in order to reflect the light off my closed eyelid and back on to the photoresistor. This signal is then fed to the Lightstone interface which acts as an analogue to digital converter with hardware connection to my computer via a short usb cable. Lucidcode do already have a suitable plugin to monitor the heartbeat and GSR (Galvanic Skin Response) by using the standard finger electrodes originally supplied with the Lightstone, including software intended for the later IOM versions. Tweaked the IR LED REM algorithm. Added a new channel: IR LED REM, for one of Rob’s custom mods that adds a photoresistor and an IR LED to the LightStone. It is disabled by default. Added HRV (heart rate variance) and HRV2 lines. HRV shows the average difference in the interval between heartbeats over the last minute and HRV2 shows the difference between the last two heartbeats. Removed the BPM10 line. Added BPM and BPM10 lines. 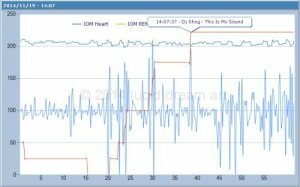 BPM counts how often the IOM Heart line is above 100 in a minute. BPM10 only counts the last 10 seconds and multiplies by 6. A small change to make it work without requiring administrative privileges. There might still be issues when running on 64-bit versions of Windows. Added the reference to UsbLib back in and renamed skin resistance to IOM GSR.